It was one year ago when the doors flung open to the most incredible and innovative display of interior design. The Seattle Showhouse hosted by ATGStores.com in partnership with Decorist and Porch was unveiled. 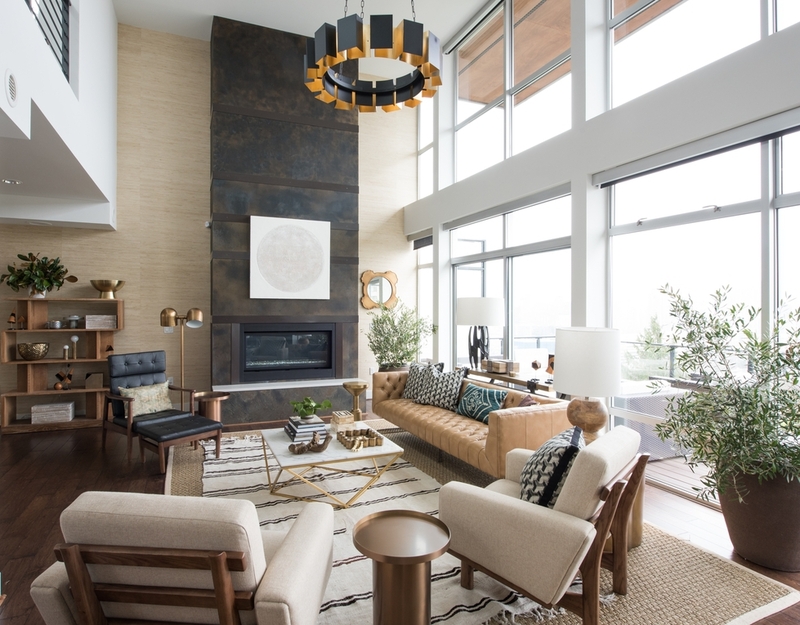 It was dubbed "the house the internet built" where some of today's most talented and up-and-coming interior designers came together to virtually design a modern home in the Queen Anne neighborhood of Seattle. Eight fabulous rooms were transformed and designed 100% online using the Decorist platform and ATG’s product line. Here’s a reminder of how gorgeous a home can be using our online interior design platform combined with our talented pool of designers! A study in neutrals and shape were the inspiration behind our design for the open concept living and dining space. Attention to the juxtaposition of furniture styles and lines was considered more than an overt color scheme for the space. This allows you to enjoy the room and surface textures while taking in the incredible view from the large windows within the main floor. We chose a retro sofa, contemporary bar stools, mid-century dining chairs and a brutalist dining table from ATG that were deftly combined with other styles that speaks to an eclectic flair and reflects a well-traveled life. The family room is intended as a cozy space to watch TV, read and hang out any time of day. Faced with boxy architecture and vast expanses of blank walls, one of our biggest goals in this room was to create some texture and layers, which we achieved by wrapping the walls in a warm natural grasscloth, and then by layering a hide on top of a natural fiber rug. We added wooly textures, gold accents, chunky rattan and chalky plaster. Pillows, artwork and even lamps add some interest with charcoals and varying shades of blush and rose. Our favorite piece(s) is the pair of white plaster mirrors from ATG by Arteriors. The mirrors have such an edgy texture but feel soft in the white matte finish. We chose to hang them stacked horizontally to foil the otherwise 90 degree angles and squared corners elsewhere in the room. We wanted to create a home office that was eclectic and had a curated, lived-in feel. Since the office is open and situated in a central part of the home, with prime views of the downtown Seattle, we wanted to keep the palette fairly neutral. We filled this the space with a lot of personality and character, creating great contrast and layering on lots of texture. We painted the built-in desk and bookcase black and switched out the hardware for brass. We fearlessly mixed metals for added flair, incorporated amazing lighting and used fun, corky art to help create mood and ambience. A black and white graphic wallpaper from ATG by Guildery was chosen on the accent wall to elevate the overall design. 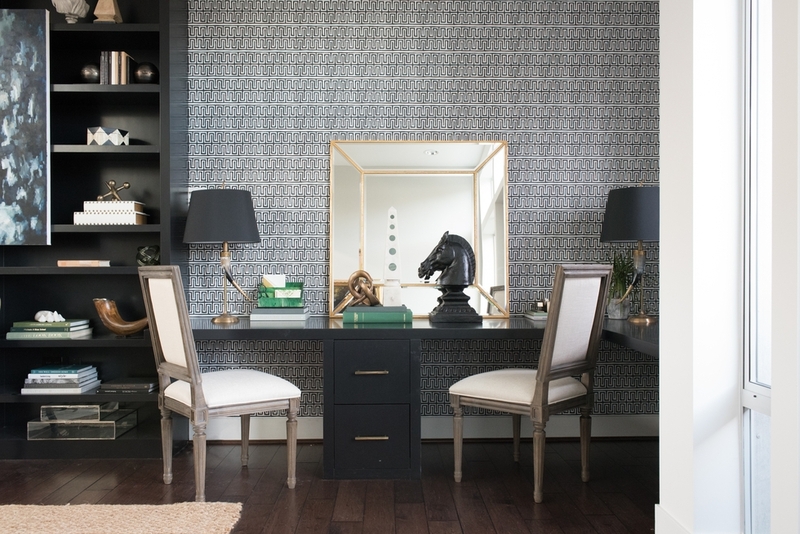 The result is a functional yet fabulous home office that exudes fearless style. Since the kitchen is open to the rest of the house it was my goal to have it flow with the other designs nearby. I first painted all the cabinets black and added white quartz counter tops to help give the space a casual glam look. There were so many great ATG pieces to choose from, so I allowed myself to just play with the many different styles. I particularly love the juxtaposition of the show-stopping chandelier over the rustic table paired with the black mid-century chairs. The fabulous light fixture draws the eye, adds just the right amount of glam and has a delicateness that doesn’t compete or obstruct the amazing view. A graphic shag rug was chosen to go under the dining table to anchor the eating area and add warmth to the tile floor. I also like the hoop chairs for their added drama and their interesting texture. The architectural side table and the leather poufs also helped to create an earthy, relaxed feel which softens the seating area around the fireplace. The foyer is the gateway to the home. My goal was to create a space that would set a playful but warm tone for the rest of the house. It’s intentionally a bit dramatic as you won't tire of these interesting elements the same way you could if they were in the living room or bedroom. Since the home is contemporary I went with a more modern-eclectic feel. I added the mirror to help reflect some light into the dark space and thus alludes to a larger more vibrant area. The mirror also serves a functional purpose for a "last look" before leaving the house for the day and the round shape helps break up the angles and the narrow nature of the space. The neutral color palette allows Brian Paquette’s black and white geometric wallpaper to be the bold element in the design. And, of course, the "nook" could have easily been overlooked and left to gather dust but, instead I thought it made for an unexpected, intimate seating area. A make shift library, comfy seat for cocktail hour, or a stylish spot to lace up your shoes before heading out. If you give every area a purpose (whether it's functional or simply intended to evoke a feeling or a smile) your house will feel more like a home. For a tween girl who will soon be a teenager, my objective was to create a stylish, timeless room to dream in. I wanted to transform her space into a place for her to be inspired, spend time with her friends and study. Natural wood and whimsical accents like the darling printed wallpaper from Abnormals Anonymous and the gold globe hanging lights add color and texture to the room. My favorite piece from ATG, a hanging rattan chair, keeps the overall look fresh and modern and is the perfect place to read a book, hang out with friends or listen to music. White bedding, lavender and turquoise pillows and the two ottomans at the foot of the bed add extra seating for friends. A chic French designed bed with an upholstered linen headboard is a classic addition. It’s a room that is youthful but also sophisticated and timeless. Designing a room with a 15 year old boy in mind who is interested in rowing and music was my overarching goal. I wanted to create a room that would not only satisfy his tastes but that was well designed and full of character. I went for a rustic nautical vibe with the furnishings and art. I chose Sherwin-Williams Lazy Grey paint color on the walls to reinforce the theme and to be reminiscent of the overcast Seattle sky. An upholstered navy blue headboard juxtaposed with a modern lounge chair gives the space a warm, masculine sensibility. The pops of orange with the desk chair and the throwback Crosley turntable added a fun color and a nice personalized touch. “Gleam” by local artist Kelly Johnson is a personal favorite and feels spot on for this space. I gravitated toward a neutral palette with clean lines, a palpable sense of comfort and with pops of red that keep the eye entertained. For the walls and textiles, an assortment of gray patterned pieces that reflect my passion for geometry and contrast were chosen. There is a famous story of the artist JMW Turner entering a Royal Academy exhibition and painting a single daub of red paint on the middle of his seascape — the tiny red buoy made the painting a masterpiece. I unabashedly borrow ideas from the masters of art and architecture. I’m no master myself, but my daubs of red can be found in unexpected places throughout. We hope you enjoyed revisiting all the great designs as much as we enjoyed working with this talented crew of designers. And what it means for YOU, is the ability to work with our incredible designers, within your style and budget, all for a flat fee. They too can transform your space — 100% virtually — into a showhouse-worthy home! Start your design project with Decorist today.